Although the recently published The Art of Living According to Joe Beef: A Cookbook of Sorts (2011) begins with selections from DeLottinville’s article – albeit with the discussions of working-class politics and culture noticeably absent – it quickly becomes clear that the form of living described within would be much more recognizable to the educated leisure class that makes up today’s ‘foodie’ universe than the original Joe Beef or his clientele of “sailors and longshoremen, unemployed men and petty thieves.” Written by the founders of contemporary Montreal restaurant Joe Beef – which has been described by celebrity chef and tastemaker David Chang as his “favorite restaurant in the world” – the ‘cookbook’ establishes its distance from this world of unskilled labourers and thieves by presenting the reader with the decadent “Fois Gras Parfait with Madeira Jelly” as its first recipe and by including an entire chapter dedicated to fine French wines. For me at least, this led to two connected questions: why are the restaurant and the cookbook alike named after this (in)famous character from the rough world of Montreal’s working-class history and, more importantly, what does this tell us about the current, and very strange, moment in food culture? As it turns out, this surprisingly lively, funny, beautiful and thought-provoking book provides a fascinating glimpse into the way that food traditions are invented and sustained and, in the process, reinvents Montreal as one of the world’s top culinary destinations. The most immediately striking thing about The Art of Living According to Joe Beef is its almost manic eclecticism. In addition to the expected recipes, it also includes everything from a short essay on the history of food in Quebec, a PEI travelogue, instructions on how to build a restaurant scale smoker from scratch (with technical drawings), a list of (mostly crackpot) food theories (! ), instructions for putting together a fake Scandinavian smorgasbord, detailed descriptions of the best train routes in Canada, instructions for “building a garden in a crack den” and I can’t even finish listing what else. Oh yeah, “winemaker questionnaires” and instructions for making your own absinthe are also included. Somehow, however, the story being told is not the incoherent mess that this description indicates but, instead, is a somewhat fantastic bricolage of images, smells, tastes, and memories that manages to give a compelling account of our current culinary moment and something of a unique commentary on Montreal’s popular self-image in the post-Quiet Revolution era. Chip shacks and delis, for instance, are placed on as high a pedestal as groundbreaking Montreal restaurants like Toque! or Citrus. Recipes simultaneously look traditional and modern, high-end and low-class, French and English (and Jewish and Irish and Haitian and many of the other groups that make up contemporary Montreal) and therefore range from the fanciful tongue-in-cheek high/low hybrids like Pork Fish Sticks or a Fois Gras Breakfast Sandwich to the more traditional and straightforward Pate en Croute, Schnitzel of Pork, or Chicken Jalfrezi. Sure, the history is often of the not-quite-true variety and most of its recipes would be unfamiliar or inaccessible to the average Montrealer, but the book presents a fascinating and compelling argument for a truly unique Montreal culinary tradition that traces its lineage from habitant culinary traditions to the original Joe Beef’s Canteen, fine French restaurants, and roadside casse-croûtes. Perhaps tall tales and half-histories are essential to the act of imagining and inventing culinary traditions across time and space. Taste is, indeed, personal and the food at the original Joe Beef’s Canteen was probably awful. This imagined Montreal – made real at the contemporary Joe Beef and through this cookbook – looks to me like a vibrant, living cuisine – grounded in Montreal’s past – and looking confidently to the future. 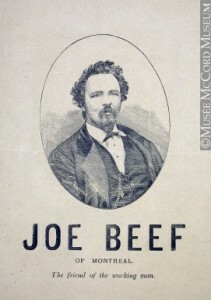 Peter DeLottinville, “Joe Beef of Montreal: Working-Class Culture and the Tavern, 1869-1889” Labour/Le Travailleur8, 9 (Autumn/Spring 1981/82), 10. Frédéric Morin, David McMillan & Meredith Erickson, The Art of Living according to Joe Beef: A Cookbook of Sorts (Berkeley: Ten Speed Press, 2011),47. Morin, McMillan and Erikson, Joe Beef, 47. Morin, McMillan and Erikson, Joe Beef, 52. The liberties are kind of what makes it a great cookbook! I didn’t write about the chapter on ‘Trains!’ but the nostalgia and love for history is infectious. Most historians only wish that our students were this passionate about the past. I concur with Ian. I have very fond memories of the DeLottinville article from undergrad, and I truly think that students should be encouraged to view Art of Living According to Joe Beef alongside it as public history.